One thing that really saves me a lot of time is cooking ahead. We always like to eat hard-boiled eggs and brown rice in our diet. These two staples are the launching pad for many a delicious meal. 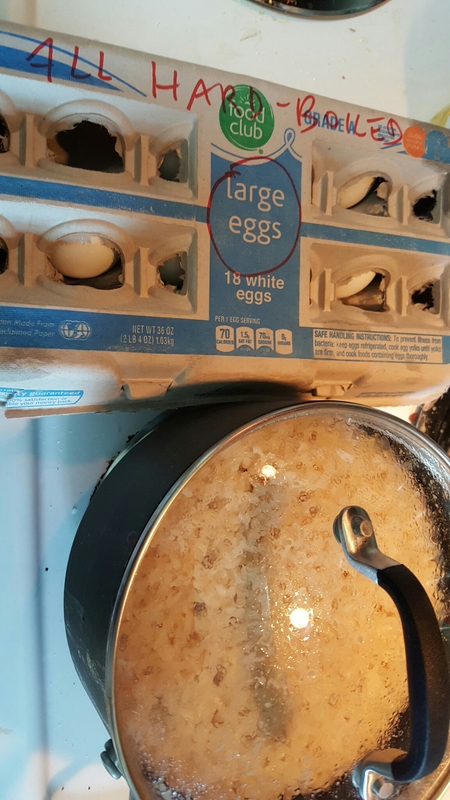 When I have a little extra time where I can mind the stove, such as today, a day off from work, I will make a big pot of brown rice, and boil a lot of eggs, plenty to satisfy my husband, and the two dogs who love eggs just as much as we do! The eggs often wind up covered with horseradish, find their way into salads, or are just enjoyed on their own with a little salt and pepper. Brown rice, an impetus to make stir fry, rice omelettes, and of course vegetable-fried rice, a family favorite! When you have a bed of rice, a little hot sauce and butter make a quick meal! If I could find it, I would show you. I have a t-shirt I bought years ago at Comic-Con. It says, rice is nice. Previous Not another phone book! I too am an egg fan.